There was a dead mouse hanging from inside the wire trap she was holding. The mouse was the bait. She was the local pest removal expert trying to catch the snake in my neighbor’s garden yesterday. Not the snake they’re looking for. Sulfur powder sprinkled to deter snakes. So now my neighbors have itchy snakes in their gardens. I should mention that my husband found a snake in our living room a few weeks ago while I was still in America. It was the length and breadth of a wide shoelace with a head the size of an almond. It was extremely docile and he easily coaxed it outside. Someone later told us that it is very lucky to find a snake inside one’s house. This same person asked my husband why he didn’t “pop it,” meaning to quickly kill it by grabbing its tail and slamming its head against the ground. She said this would kill the snake but not the lucky blessing. Is this the snake they’re looking for? The one found in our house? But, despite my apprehension, we haven’t seen the small brown snake since it slithered off. It seems, however, that our neighbors have. Is this tiny thing the snake that they’re trying to rid themselves of? If so, I hope it scurries back off to the jungle before anyone has the chance to “pop it,” trap it or strike it with a shovel. Snakes are ok. We used to catch gartner snakes (sp?) when we were kids. I don’t know how much fun and games they are in Asia though. In TW even the inch worms and catapillers are poisonous. But since its in your garden I think you can breath easy. That little guy has probably been gone for weeks. I suppose I need to take the time to look up and remember which snakes are actually poisonous in HK. Probably not really that many. So long as they’re relatively docile, I don’t really mind having them around. My neighbors certainly do, though! Two new batches of sulfur powder were sprinkled today. No news on whether the trapping was successful. 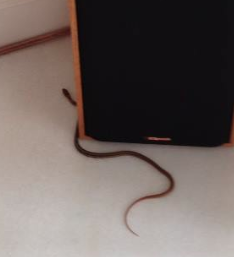 I remember 2 years ago when a snake suddenly appeared in the living room in our old apartment, I was screaming like it was the end of the world and my husband was out of the house in less than 5 seconds LOL Luckily our neighbor helped us get rid of it because my husband would not get near it at all! 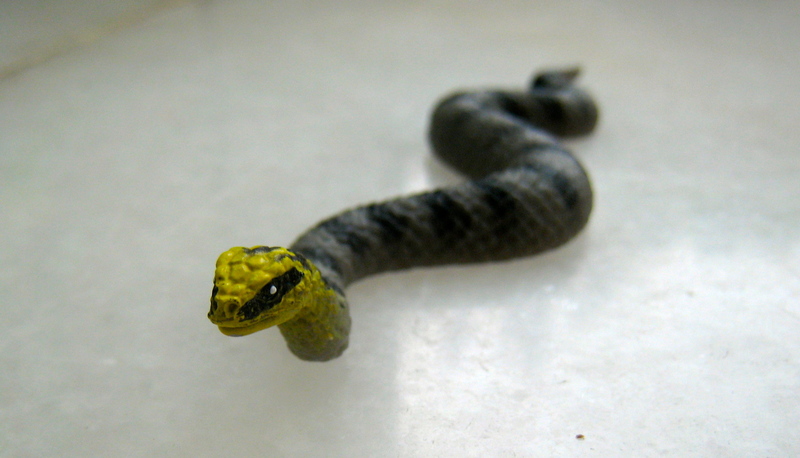 To test the snake=luck hypothesis, do you remember if anything particularly fortunate happened post-snake invasion? Where ARE you to get all these snakes in the house? And snakes isn’t being used as a euphemism for something else, right? You must be referring to Vanilla Housewife’s double-snake sighting? My snake is completely non-ephemistic. But perhaps my neighbors are reading a double-meaning into their snakes? Uck! I am not a fan of snakes. I never saw any in Hong Kong, but I have friends who did, and I saw several in Taiwan. Was always worried because they were poisonous! Thankfully, I lived on the 4th floor (although apparently the fourth floor was also bad luck? Because “4” sounds like death in Mandarin?…) Anyway, around here we have rattlers. I’m not a fan of them, either. When we first lived in China, the mobile phone company assigned me a phone number with five “4”s in it. They must have been happy to have a foreigner walk in so they could off load one of the unlucky numbers! We must almost be neighbors then! One week on and from the depth of the sulfur powder being sprinkled around, I think my neighbors are still not satisfied that their gardens are free of snakes. As for me, I still haven’t seen it. This must be a Chinese rather than HK thing as we live in Singapore by a little bit of jungle and occasionally get Equatorial Spitting Cobra or King Cobra coming out (personally don’t get close enough to check the difference). You know when one has been seen as they put sulphur down on the sides of the path (picture in my recent post linked). We lived up mid-levels of HK but never saw this probably way too populated. 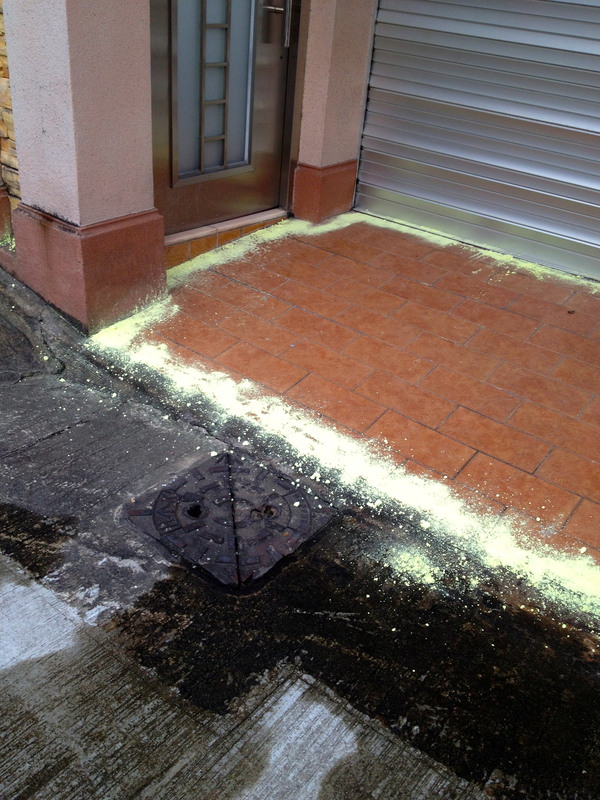 The sulphur is spreading along my street, so there must have been more sightings. I spoke to my neighbor: whatever it is is pretty small. I still haven’t seen it. Thanks for the link to your blog! Updated my post linking to this to show it’s done in Hong Kong as well.